I painted this oil painting of Uluru – or Ayers Rock – for my mom. We took a family trip to Australia in 2007 (well, it was really my parents’ 25th anniversary trip that I crashed because there was no way I was missing out on a trip down under – I’m a brat, yes I know) and absolutely fell in love with the beauty of the country, especially the Australian Outback. The Outback is the term used to describe the vastly unpopulated and arid center of the Australian continent. It is very remote and water is scarce. What was most incredible to me was learning about the Aboriginal people (who were the original inhabitants of the Australian land mass) and the ways in which they were able to survive in such rough and unforgiving conditions. Uluru is a sacred place for the Aboriginal people and has been used in traditional ceremonies for thousands of years. During our trip, we spent a few days in The Outback and took several tours in the Uluru-Kata Tjuta National Park. 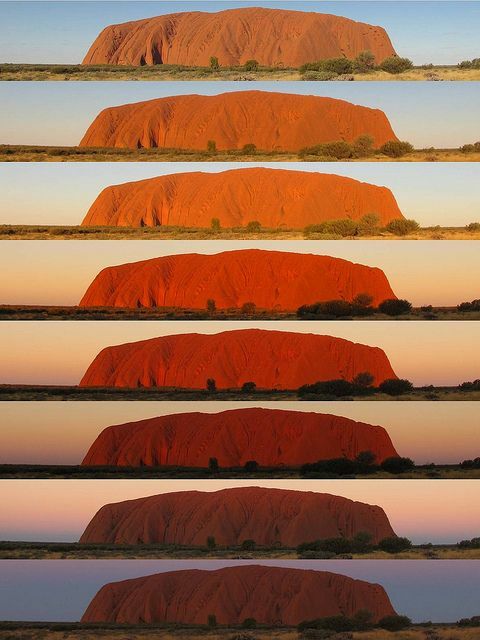 We were able to see Uluru at both sunrise and sunset; it was really spectacular to see the colors of Uluru change with the sun – as shown in the photo below. I originally painted Uluru for my mom in 2008, which was only 2 years after I started taking oil painting lessons. My painting abilities have advanced a lot over the last 8 years, so I decided to paint the piece again. The difference between what I was able to paint then and now is incredible. My perception and use of color, brush strokes, light and darkness…I’m almost embarrassed to show the 2008 painting, but am including a side-by-side comparison just to show what a difference 8 years can make. For starters, the reference photo I used for each painting was a little different, and I have since learned how to properly photograph my paintings, so some of the differences between the two paintings are because of those two things. We had such a wonderful and memorable trip, I would go back in a heartbeat! Below are some photos taken at Uluru, Kata-Tjuta, which is the lesser known rock formation in the Outback, and in Sydney. We climbed the Sydney Harbour Bridge – it was so windy but an awesome experience nonetheless!